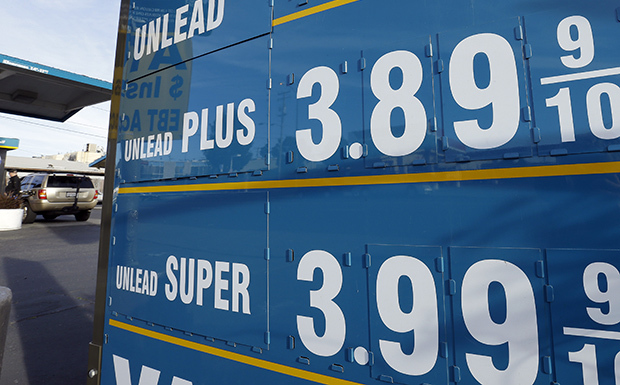 American families have been plagued by higher oil and gasoline prices over the past several years despite a significant increase in domestic oil production and a decline in consumption. But while high gas prices threaten the economy and family budgets, they enrich oil companies with huge profits. Apparently that doesn’t bother House Budget Committee Chairman Paul Ryan (R-WI), since his proposed fiscal year 2014 budget resolution appears to again keep a decade’s worth of oil tax breaks worth $40 billion for the oil-and-gas industry. Even more astounding, the budget would give the five biggest oil companies an additional multibillion-dollar tax cut by slashing the corporate income tax rate. Rep. Ryan’s latest budget is a retread of the budget, complete with oil giveaways, that he and Republican presidential nominee and former Massachusetts Gov. Mitt Romney ran on in 2012—and which was soundly rejected by voters in November. Hasn’t Rep. Ryan learned anything? In addition to the apparent retention of these existing special tax breaks, Rep. Ryan’s FY 2014 budget explicitly includes the Romney presidential campaign’s economic plan proposal to cut the corporate income tax rate from 35 percent to 25 percent—nearly a one-third reduction. That could provide an additional combined tax cut of at least $2.3 billion annually to the big five oil companies, according to an analysis of their 2011 public financial statements. That includes $1.5 billion for the three domestic oil companies and $800 million for the two foreign-owned companies. Since it is of course impossible to predict their future profits, this estimate is based on their 2011 financial data, including their U.S. federal income tax expense. 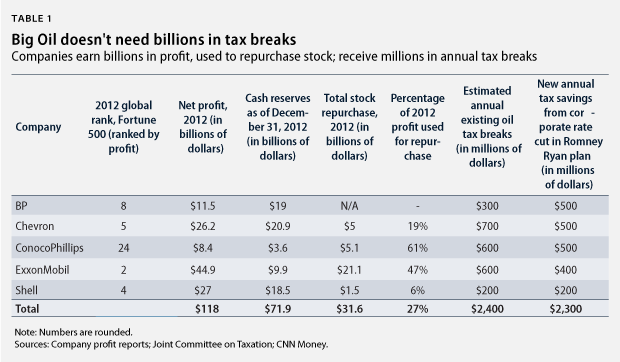 The companies can’t afford to lose these tax breaks? Fortune magazine ranked ExxonMobil and Chevron as the first- and second-most profitable companies in 2012; ConocoPhillips was the 13th-most profitable company. The entire industry’s total revenue loss from cutting the tax provisions is about 1 percent over the next decade. Giving taxpayers’ money to oil companies will help increase oil production? The big five oil companies actually produced 3 percent less oil in 2012 compared to 2011. Big Oil already pays its fair share of taxes? The big three U.S. publicly owned companies—Chevron, ConocoPhillips, and ExxonMobil—paid relatively low federal effective tax rates in 2011. Reuters reports that their tax payments were “a far cry from the 35 percent top corporate tax rate.” Their effective federal tax rates in 2011 were: ExxonMobil, 13 percent; Chevron, 19 percent; and ConocoPhillips, 18 percent. Big Oil needs as much capital as possible for exploration? In 2012 the big five oil companies spent nearly $32 billion—or 27 percent of their profits—buying back their own stock to enrich their top executives, boards of directors, and biggest shareholders instead of using these revenues to produce oil and gas from thousands of undeveloped leases. The Ryan budget’s apparent retention of 100-year-old tax breaks while adding new ones ignores the century of federal support for oil production. According to an analysis by DBL Investors, the oil-and-gas industry received a total of $446 billion in government subsidies from 1918 through 2009. Meanwhile, the renewable energy industry received just $5.5 billion from 1994 to 2009. Moreover, over this time U.S. taxpayers invested $80 in oil for every $1 invested in clean, renewable energy. So why does Rep. Ryan’s FY 2014 budget proposal seem to leave these Big Oil tax breaks intact? Perhaps the answer is as simple as that old saying, “follow the money.” Koch Industries, a large private oil company, is Rep. Ryan’s sixth-largest campaign contributor over his career. And the oil-and-gas industry as a whole gave him $264,600 in campaign cash. Or maybe Rep. Ryan maintained these oil tax breaks because Big Oil gave Republican incumbents and candidates 90 percent of their $70.5 million in donations in the 2012 election cycle. This is a higher proportion than the 78 percent of $348 million in donations Big Oil gave Republican congressional candidates beginning in 1990. The oil-and-gas industry also gave the Romney-Ryan campaign $5.4 millionduring the 2012 presidential election. As he promotes his new budget, Rep. Ryan will make numerous claims about the urgency of cutting the federal budget deficit to justify cuts in clean energy, health care, education, and other priorities essential to a vital American middle class. Adding to the $40 billion in existing tax breaks for rich Big Oil companies profiting from high gasoline prices makes his rhetoric hypocritical at best and a lie at worst. The public won’t be fooled by Rep. Ryan’s claims. Hopefully the media won’t be fooled again, either.